This year Operation IceBridge has returned twice to the Pine Island Glacier, the site of a massive glacial crack poised to potentially create an iceberg the size of New York City. Operation IceBridge returned to the Pine Island Glacier twice in 2012, and NASA glaciologist Kelly Brunt discusses the implications of the glacier's impending calving event. 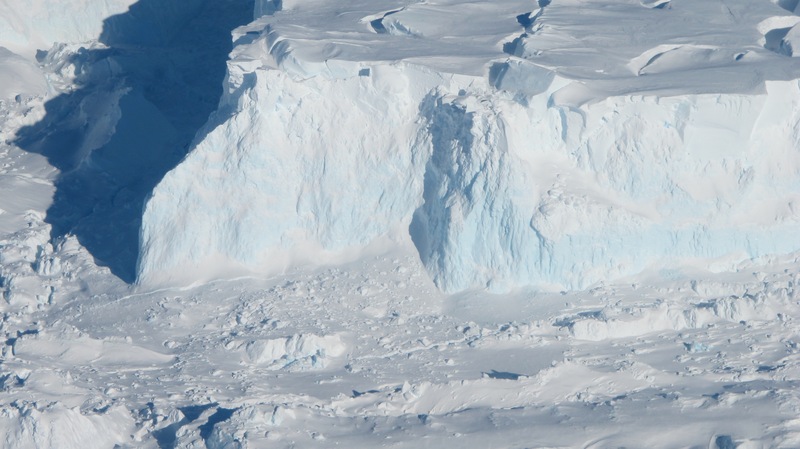 the birth of a massive new iceberg may be more likely. 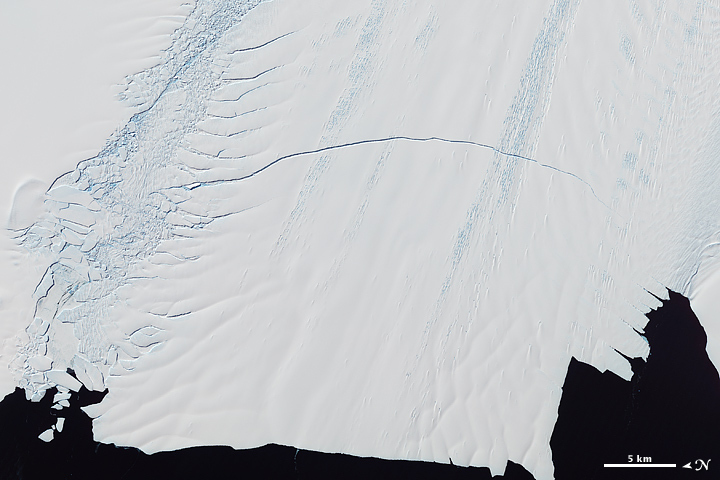 The giant crack in Pine Island Glacier was first spotted by scientists with NASA's IceBridge mission in 2011 as they surveyed the massive ice shelf in their specially equipped DC-8 plane. 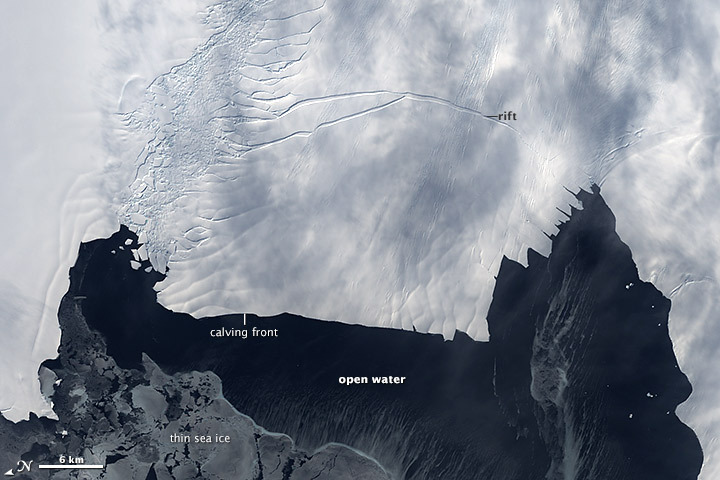 A second rift also formed and joined the northern side of the crack in May 2012, as captured on satellite images that track the incipient iceberg. When IceBridge scientists returned this month, they discovered the original rift now has only about half a mile (less than 1 kilometer) to go before the 300-square-mile (770 square kilometers) berg forms. 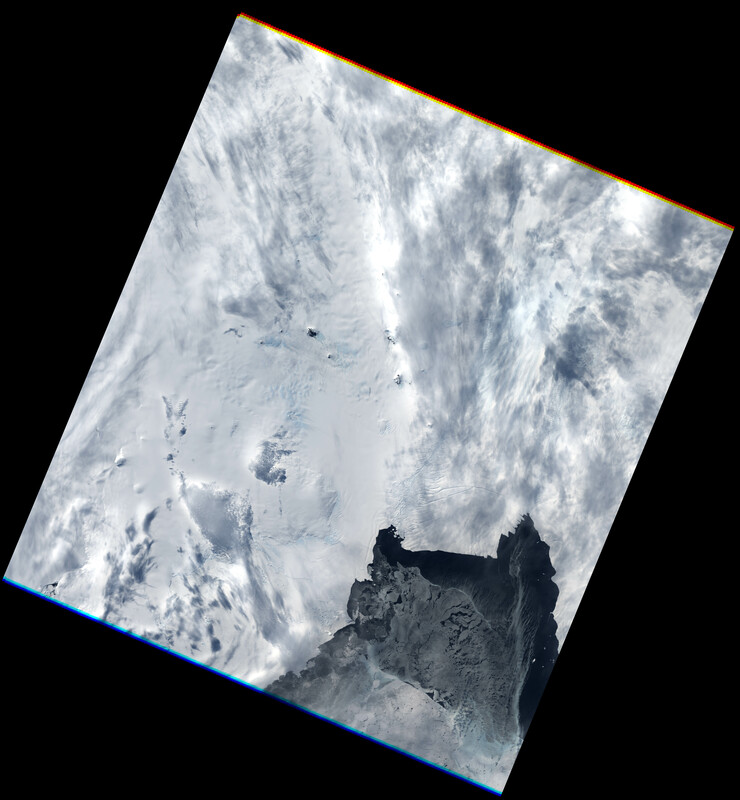 The calving front of Pine Island Glacier is also free of sea ice, as shown in an Oct. 26 image from the Landsat 7 satellite. Warm spring temperatures are melting the sea ice that rings the continent during the winter, and winds help push the remaining ice out to sea. Sea ice acts as a buttress against waves, protecting the front of the glacier from calving, Kelly Brunt, a cryosphere scientist at NASA Goddard Space Flight Center, said in a NASA video about the Pine Island Glacier rift. "So the fact that there's no sea ice in front of the Pine Island Glacier right now implies that it might be in a state that's sort of primed to calve," she said. 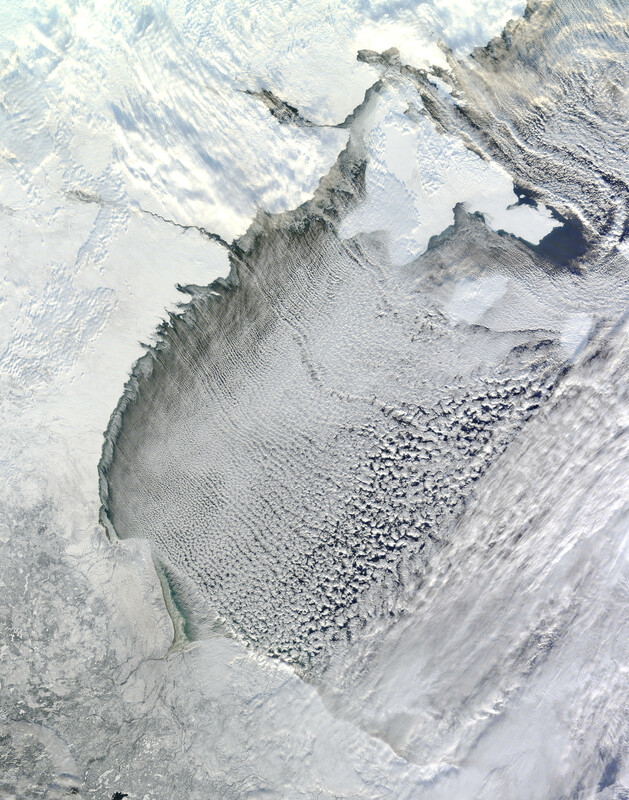 On November 13, 2012, the Moderate Resolution Imaging Spectroradiometer (MODIS) on NASA’s Terra satellite captured this view of cloud streets amidst northwesterly winds over Hudson Bay. 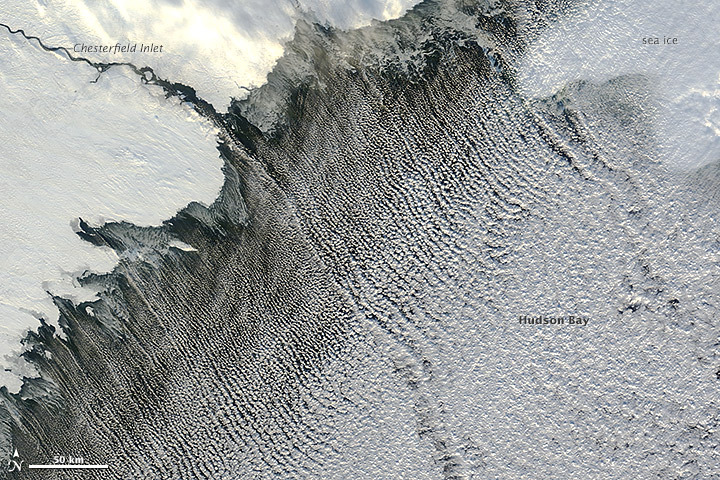 Cloud streets—long parallel bands of cumulus clouds—form when cold air blows over warmer waters, while a warmer air layer (or temperature inversion) rests over the top of both. The comparatively warm water gives up heat and moisture to the cold air above, and columns of heated air called thermals naturally rise through the atmosphere. The temperature inversion acts like a lid. When the rising thermals hit it, they roll over and loop back on themselves, creating parallel cylinders of rotating air. As this happens, the moisture in the warm air cools and condenses into flat-bottomed, fluffy-topped cumulus clouds that line up parallel to the prevailing wind. Cloud streets can stretch for hundreds of kilometers if the land or water surface underneath is uniform. Sea surface temperature need to be at least 21°C to 22°C degrees (39°F to 41°F) warmer than the air for cloud streets to form. 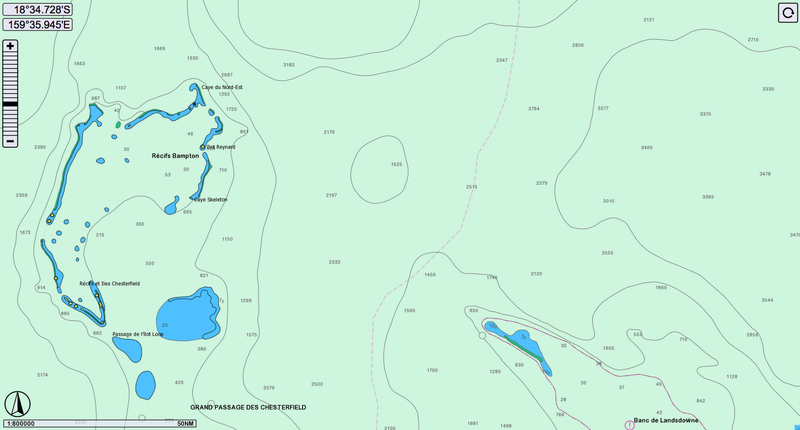 Neither the French government - the invisible island would sit within French territorial waters if it existed - nor the ship's nautical charts, which are based on depth measurements, had the island marked on their maps. 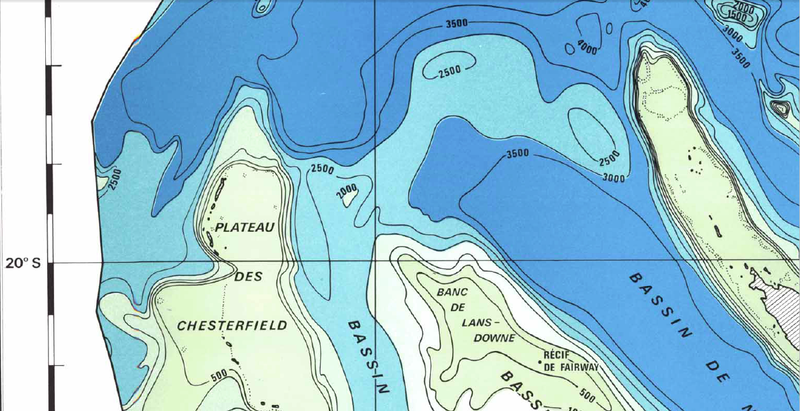 Australian newspapers have reported that the invisible island would sit within French territorial waters if it existed - but does not feature on French government maps. 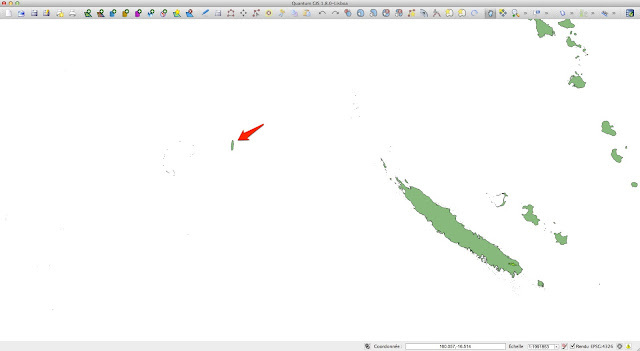 said the world coastline database incorporated individual reports that were sometimes old or contained errors. 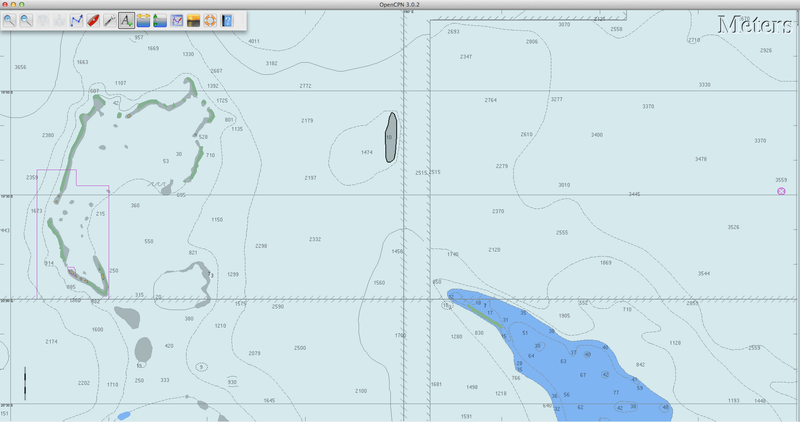 Australia's Hydrographic Service, which produces the country's nautical charts, says its appearance on some scientific maps and Google Earth could just be the result of human error, repeated down the years. 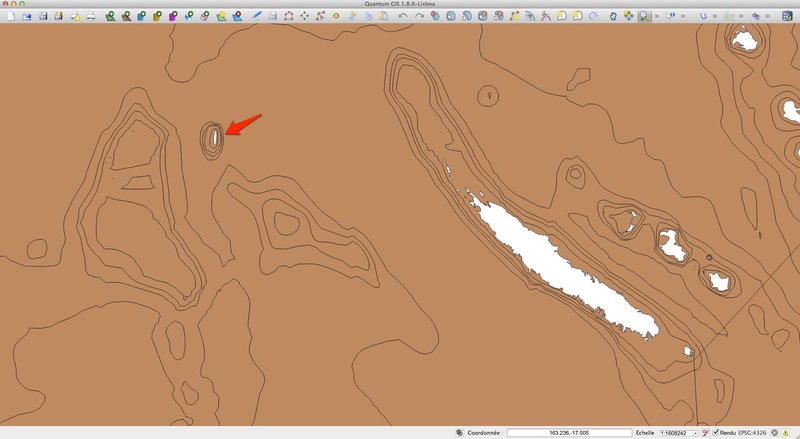 Mike Prince, the director of charting services for the Australian Hydrographic Service, a department within the Navy, said that while some map-makers added non-existent streets in order to keep tabs on people stealing their data, that was not standard practice with nautical charts. “[That would] reduce confidence in what is actually correct,” he said. 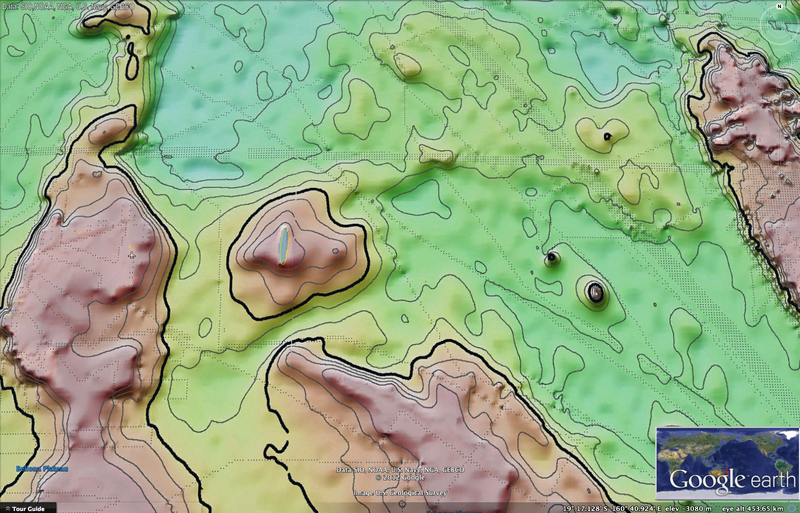 A spokesman for Google Earth said they consult a variety of authoritative sources when making their maps. 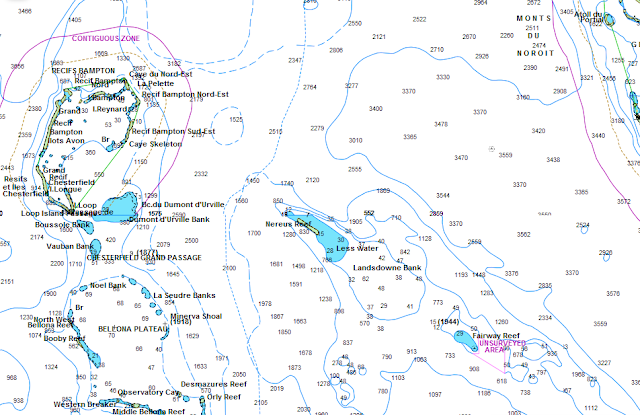 The BBC's Duncan Kennedy in Sydney says that while most explorers dream of discovering uncharted territory, the Australian team appears to have done the opposite - and cartographers everywhere are now rushing to un-discover Sandy Island for ever. 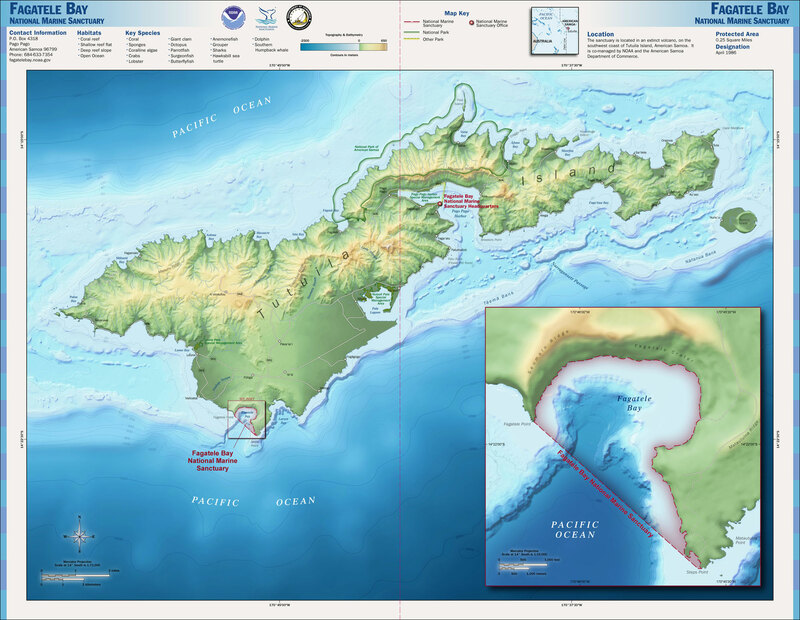 Map of National Marine Sanctuary of American Samoa, America's largest marine sanctuary. A pristine tropical reef that has weathered several natural disasters is now part of America's largest marine sanctuary. The National Oceanic and Atmospheric Administration (NOAA) finalized a huge expansion of the Fagatele Bay National Marine Sanctuary in American Samoa last month, from 0.25 square miles (0.65 square kilometers) to 13,523 square miles (33,024 square km). The boost takes the sanctuary from a single protected coral reef to a marine area larger than the state of Maryland. 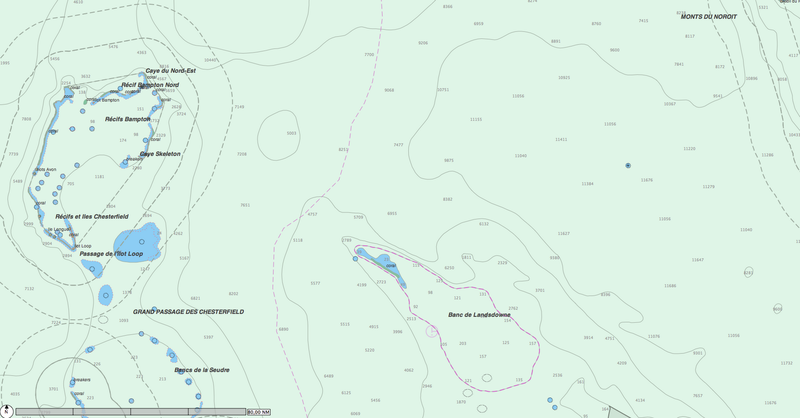 The agency also renamed the protected region, now calling it the National Marine Sanctuary of American Samoa. Five new marine units joined Fagatale Bay's reef: Fogama'a/ Fagalua (Larsen Bay), waters around Swains Island and Muliva, also known as Rose Atoll, and some of the waters around Aunu'u Island and Ta'u Island. NOAA cited the "tremendous advancement in marine discovery and exploration, marine conservation science, and ecosystem-based management" as factors in its decision to expand the sanctuary. The decision was published July 26 and finalized Oct. 31 in the Federal Register. "The Sanctuary contains a unique and vast array of tropical marine organisms, including corals and a diverse tropical reef ecosystem with endangered and threatened species, such as the hawksbill and green sea turtles, and marine mammals like the Pacific bottlenose dolphin," NOAA said in the Federal Register. Of the five new units, one was already under federal protection. Rose Atoll was designated a marine national monument in 2009 by President George W. Bush. It is the world's smallest atoll, and home to American Samoa's largest populations of giant clams, nesting seabirds and rare reef fish. Ta'u Island hosts some of the oldest and largest known corals in the world, with one colony measuring 23 feet (7 meters) tall and 135 feet (41 m) in circumference, according to NOAA. And from June to September, southern humpback whales migrate north from Antarctica to calve in the protected waters surrounding American Samoa. 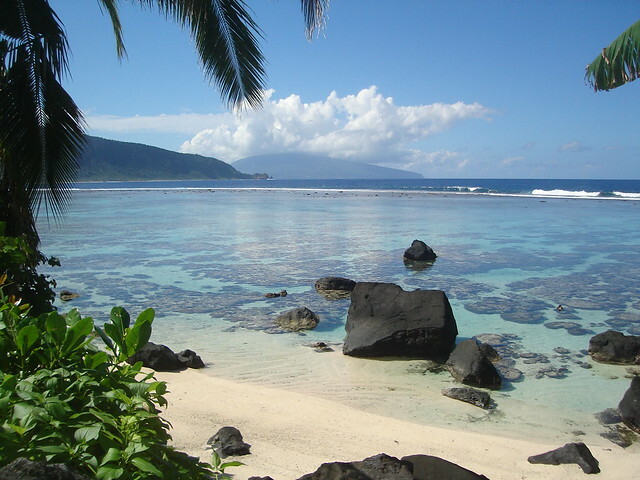 Fagatele Bay National Marine Sanctuary was established in 1986 in response to a proposal from the American Samoa government. 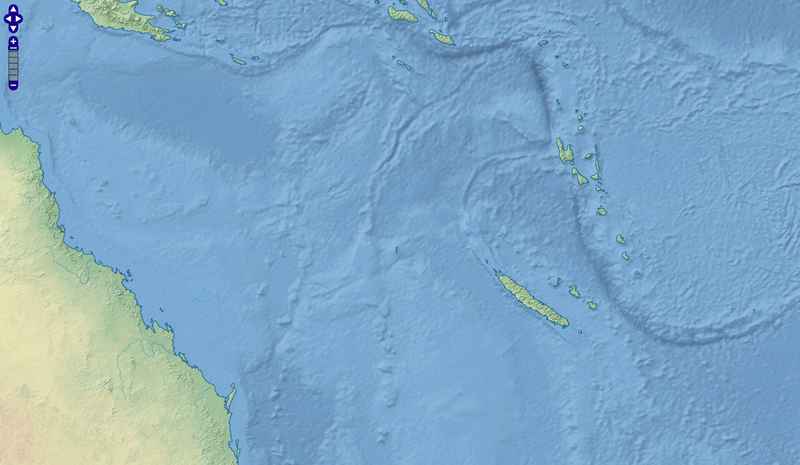 The impetus was a devastating attack on the region's coral reefs by crown-of-thorns starfish in the late 1970s. Millions of starfish ate their way across the reefs, destroying more than 90 percent of living coral. Hurricanes and coral bleaching have also hit the coral in the last 20 years. from Ryder Bay near Rothera Research Station, Adelaide Island. A new study examines why Antarctic sea ice cover has increased under the effects of climate change over the past two decades. 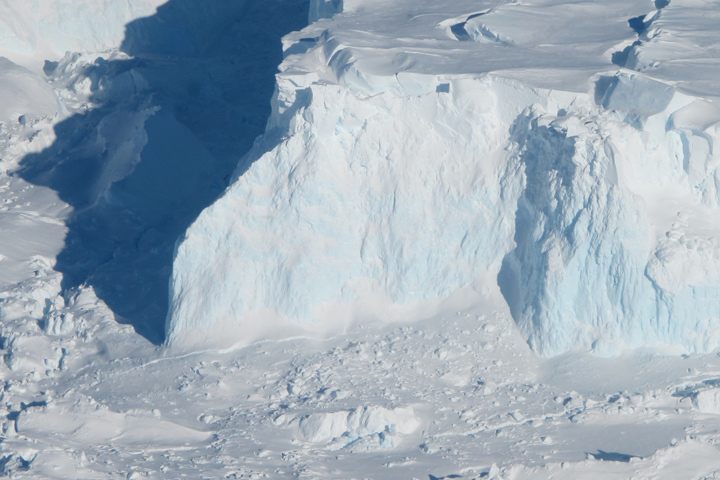 A NASA study has reported a rise in Antarctic sea ice. For cherry picking climate change deniers, it may be a neat counterweight to Arctic ice melt but, as the NASA study shows, Antarctic ice expansion is another worrying trend in global climate change. The principal finding of the new NASA study, conducted in conjunction with the British Antarctic Study, relates to a significant growth in Antarctic sea ice drift caused by changes in the wind currents around Antarctica observed over the past twenty years. Changes in wind currents can arise due to an alteration in underlying sea temperatures and it is here that the rapid ice loss seen in the Arctic Ocean may be reconciled with what would appear, at first glance, to be conflicting data from the Antarctic. The sea ice in the Arctic Ocean dropped below the previous all-time record set in 2007. This year also marks the first time that there has been less than 4 million square kilometers (1.54 million square miles) of sea ice since satellite observations began in 1979. This animation shows the 2012 time-series of ice extent using sea ice concentration data from the DMSP SSMI/S satellite sensor. The black area represents the daily average (median) sea ice extent over the 1979-2000 time period. 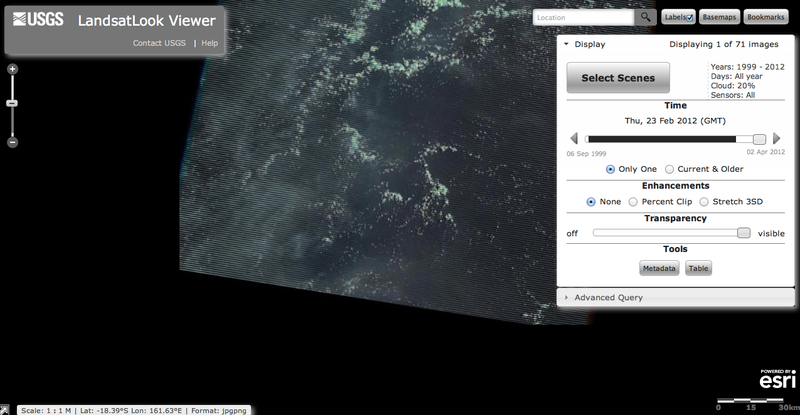 Layered over top of that are the daily satellite measurements from January 1 -- September 14, 2012. A rapid melt begins in July, whereby the 2012 ice extents fall far below the historical average. The National Snow and Ice Data Center will confirm the final minimum ice extent data and area once the melt stabilizes, usually in mid-September. In mid-October Digital Journal reported on the record ice melt of Arctic sea ice observed by NASA which now has comparative data on the Arctic polar ice cap dating back almost 35 years. 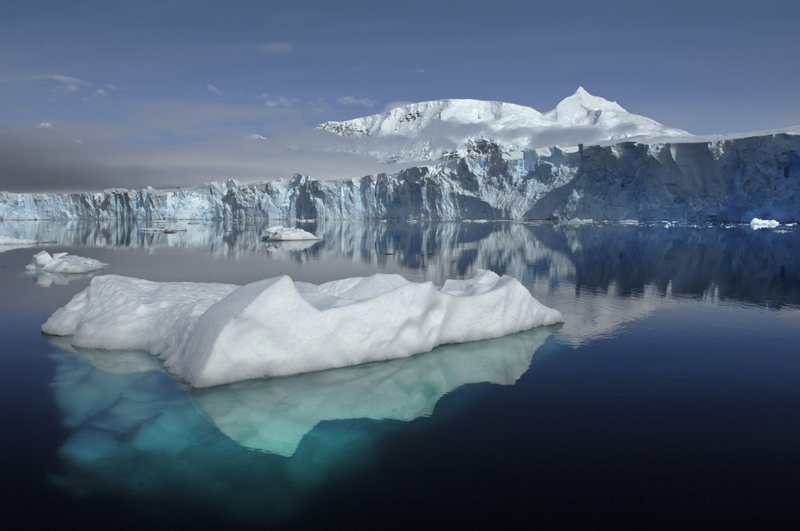 According to NASA and the British Antarctic Survey, the expansion of Antarctic sea ice is but another facet of climate change, connected to rather than conflicting with the opposite effect observed in the Arctic. Using maps created by NASA’s Jet Propulsion Laboratory (JPL) which have been built up from five million individual daily measurements of the flows of sea ice around the Antarctic continent, research scientists Ron Kwok of JPL and Paul Holland of the Natural Environment Research Council's British Antarctic Survey, Cambridge, United Kingdom have constructed a model to illustrate what is happening in the Antarctic. For the first time, researchers have been able to show long term changes in the Antarctic sea ice over a period of almost two decades using data collected by four U.S. Defense Meteorological satellites. “Until now these changes in ice drift were only speculated upon, using computer models of Antarctic winds. 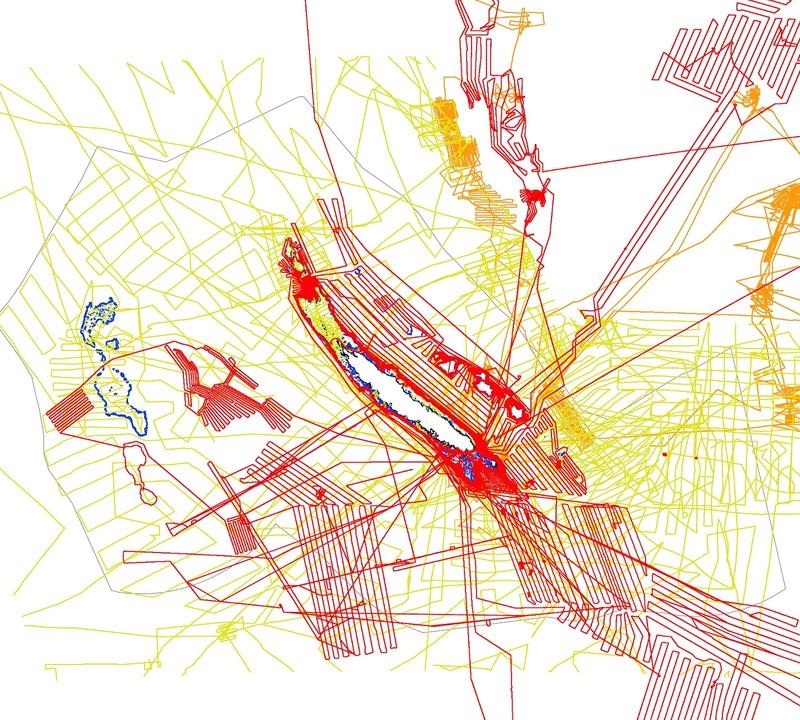 This study of direct satellite observations shows the complexity of climate change. The total Antarctic sea-ice cover is increasing slowly, but individual regions are actually experiencing much larger gains and losses that are almost offsetting each other overall. We now know that these regional changes are caused by changes in the winds, which in turn affect the ice cover through changes in both ice drift and air temperature. The changes in ice drift also suggest large changes in the ocean surrounding Antarctica, which is very sensitive to the cold and salty water produced by sea-ice growth. It is significant that whereas the headline figure is reporting a growth in Antarctic sea ice, Holland refers to this being a two-way flow with expansion of sea ice in some areas being offset by losses of ice elsewhere in seas around Antarctica. The northward drift of sea ice could help explain extremes of sea ice growth in some areas of the Southern Ocean around the Antarctic continent by means of a cooling feedback reaction. Sea ice, being white, is highly reflective of the sun’s rays whilst dark sea water in liquid form absorbs heat from the sun. Thus, expanding sea ice can cause a cooling effect encouraging the formation of more sea ice around itself. The reflective qualities of sea ice means that it plays a significant role in Earth’s environment, not only reflecting heat from the sun back into space but forming a niche habitat for a variety of marine species. At both the North and South polar regions, sea ice reaches its minimum in late summer after months when the polar regions are bathed in 24 hour sunlight. In the Arctic, however, the trend for these summer sea ice minima has been inexorably downwards, so much so that scientists now predict that the Arctic Ocean will be free of sea ice during the summer before the end of the 21st century. During Antarctica’s winter freeze, sea ice generally expands and covers an area of the ocean around the polar continent approximately twice the size of Europe. The sea ice, as well as reflecting sunlight, also acts as a blanket insulating the relatively warm seawater beneath from the sub zero temperatures in the air above. 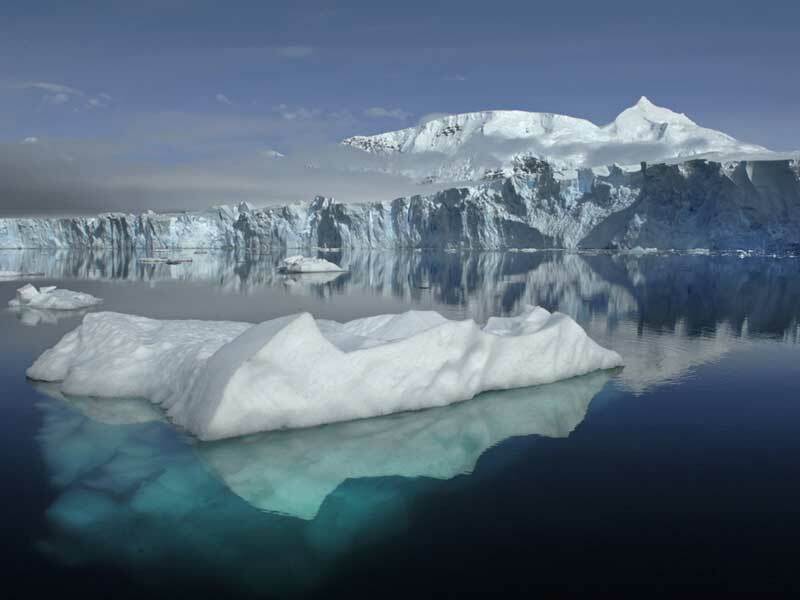 Again, changes in the sea ice, with its reflective and insulating qualities, are likely to have unpredictable consequences for the Antarctic continent and, flowing from that, climate change globally. JPL/British Antarctic Survey says the new study helps in understanding why there should be such a contrast between the two polar regions when it comes to sea ice. While the Arctic appears to be melting at an accelerating rate, over the period of the study, Antarctic sea ice in toto has actually increased, albeit slightly. The researchers state, however, that the slight net Antarctic increase in sea ice hides the underlying story of large regional increases and decreases, significant localised changes which are wind-driven. The different topography of the Arctic Ocean and Antarctica also provides some clues as to what is happening, scientists say. Whereas the Arctic Ocean is, to all intends and purposes, surrounded by land so that wind flows cannot cause Arctic ice to expand in the same way, in Antarctica and the Southern Ocean, northward winds, blowing off the continent, can force sea ice to ‘flow’ northwards as there are no land or continental barriers to halt the flow. “The Antarctic sea ice cover interacts with the global climate system very differently than that of the Arctic, and these results highlight the sensitivity of the Antarctic ice coverage to changes in the strength of the winds around the continent." Animated map of 2012 sea ice extent shown side-by-side with 1979--2009 climatology. The NASA/British Antarctic Survey report emphasises that it focused on sea ice flows and formation around the Antarctic which has to be distinguished from the land-based Antarctic Ice Sheet, glacial ice, which continues to lose volume. Although not touched on by the report, the wind induced changes in sea ice formation around the Antarctic could result in some glacial ice which would otherwise be ‘locked-in’ by sea ice, tending to calf icebergs which might not otherwise have floated off from the continental ice sheet. Elsewhere, expansion of sea ice could have as yet unforeseen localised effects on the climate. As with all climate change studies and models, due to the timescales involved in assembling meaningful data, knowing what may happen is fraught with difficulty whilst unfulfilled predictions merely serve to provide ammunition to those who would hold that climate change is a myth. The NASA/British Antarctic Survey study does not attempt to predict what the future may hold, but, just as it is unnecessary to count the spots on a leopard to identify it as a big cat, the study is yet another indication that climate change is here and now, even if some politicians think it’s a pussycat. An exceptionally rare example of one of the earliest and most significant anemographic, or wind rose, charts to appear in the 17th century. This unusual chart represents a transitional point in the perception of direction, or to be precise, the transition from the wind rose to the compass rose. Early mariners in the Mediterranean defined direction by the names the various winds and the points from which they blew. This idea traces its roots to ancient Greece. Homer identified four cardinal winds, but as navigation and cartography advanced, more were added. This chart represents a full thirty-two named winds and a multitude of different wind systems. Each of the winds is identified by several different names in Greek, Latin, French, and Dutch. 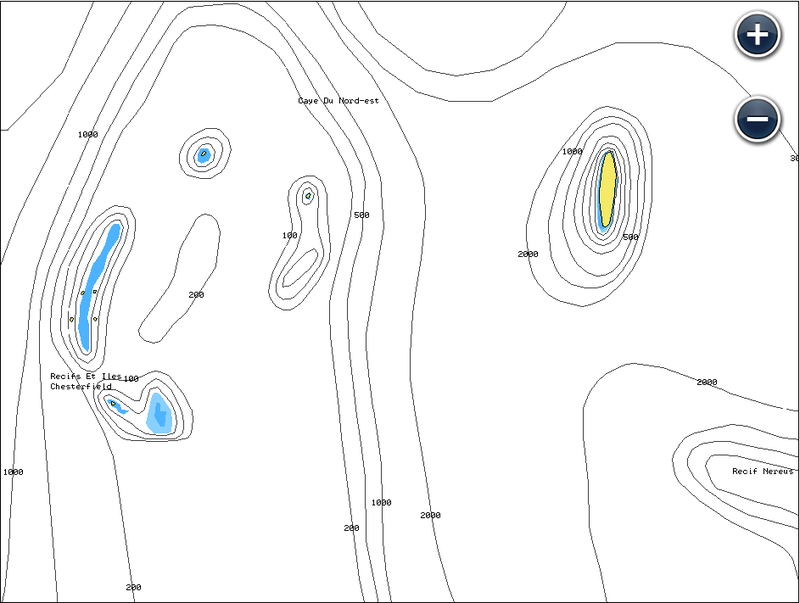 Each wind is additionally attached to both contemporary compass points, north west east and south, and a more sophisticated circle and degree system. In the areas surrounding the sphere, each wind is personified by a figure bearing the racial characteristics associated with the region or direction represented. The upper left quadrant, representing north, depicts bearded Germans or Scandinavians. The upper right, representing east, shows beardless dark skinned faces. The beardless and pale skinned figures in the lower left and right, representing west and south, are less distinguishable but may be intended to represent indigenous Americans and Greeks. Anemographic charts, like this, were functional objects and valuable reference tools. Early navigators, referring to the directions as winds, might "sail by the north wind". This was exceptionally practical when trade winds dictated ocean commerce. A warm wind from the south, for example might suggest that certain routes, closed for part of the year, were now open. 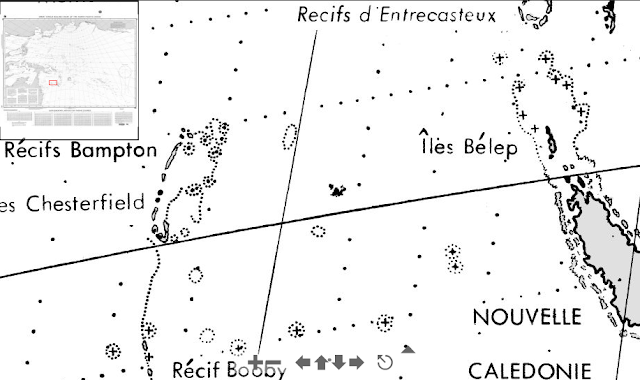 A navigator would have used this chart to compare different names for directions. So, he may be using a chart made in Greece that identified the winds by the names of Greek gods, but himself been trained to use to a different, say Catalan or English, nomenclature. 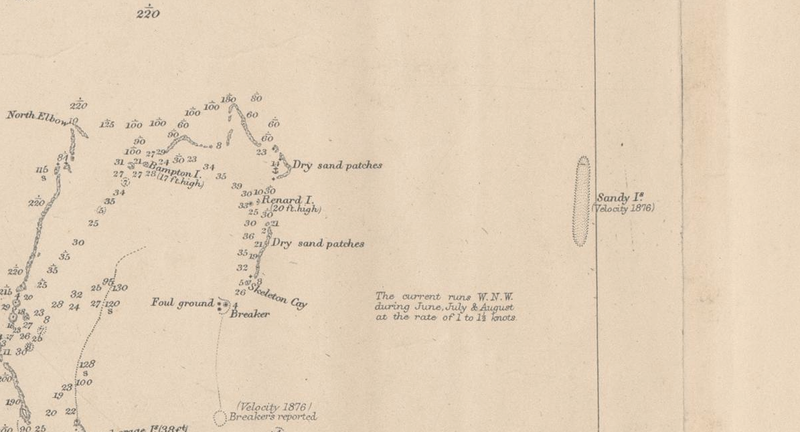 With this chart, he could figure out what various sailing logs and navigation books were referring to. 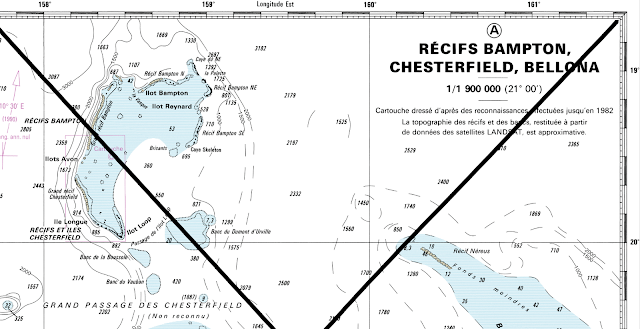 Remember, while nautical charts did exist in the 1600s, most navigation was accomplished using "Pilot Books" that had instructions like this "follow the south wind for 3 days before turning with the eastern wind" etc. Thus this was a very useful object indeed. 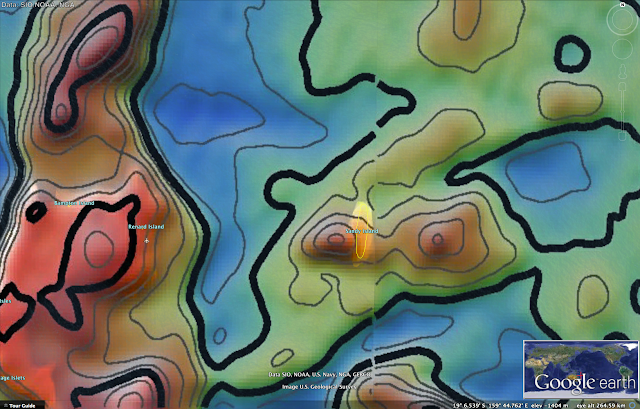 The extinction optical thickness of aerosols from a free running 10-km GEOS-5 Nature-Run including dust (red), sea salt (blue), black and organic carbon (green) and sulphate (white) are depicted from August 2006 through April 2007. GEOS-5 was run with the GOCART model providing feedbacks of the direct radiative effects of aerosols within the model in addition to their advection by the weather within the simulation. 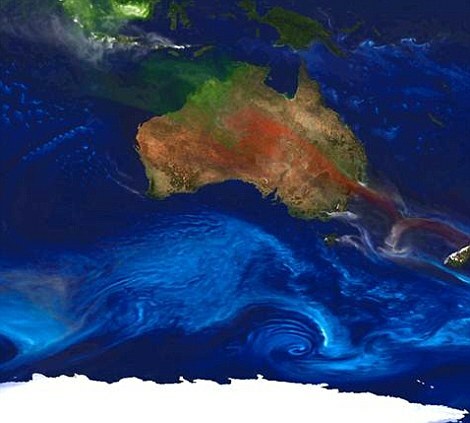 Sea-salt (blue) is churned up from the ocean based on surface wind speeds, and most prevalent along mid-latitude storm tracks and frontal regions (including the Southern Ocean) and within the circulation and eye of tropical cyclones. Dust (red) is most prominent over the Saharan desert and can be seen interacting with a few Atlantic tropical cyclones during the end of the 2006 Atlantic hurricane season. Sulphate (white) can be seen from two primary sources, those being fossil fuel emissions over Asia, Europe and the US, and also from volcanic emissions, there is a persistently active volcanic emission from Mt Nyiragongo in Mozambique Africa, and then a large eruption from the Karthala Volcano on Grand Comore Island, Comoros in January of 2007. It is an astonishing view of the Earth that reveals just what is in the atmosphere. 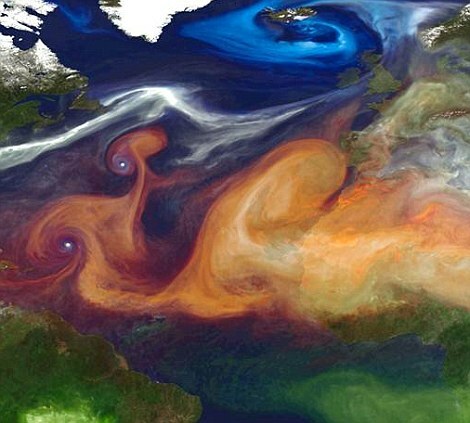 This image, released by Nasa, was created by a supercomputer designed to model aerosols in the Earth's atmosphere. It shows how dust, sea salt, smoke and sulphates travel - and could dramatically improve weather forecasts. 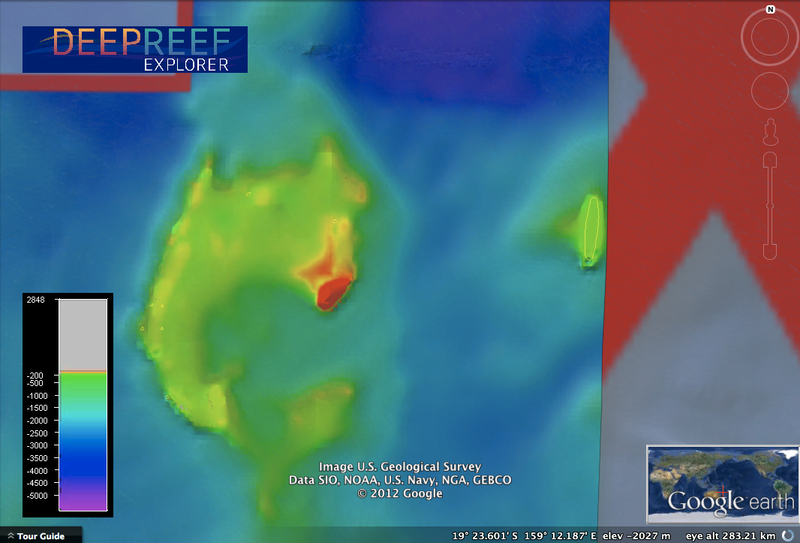 The Nasa image shows aerosols in the atmosphere. 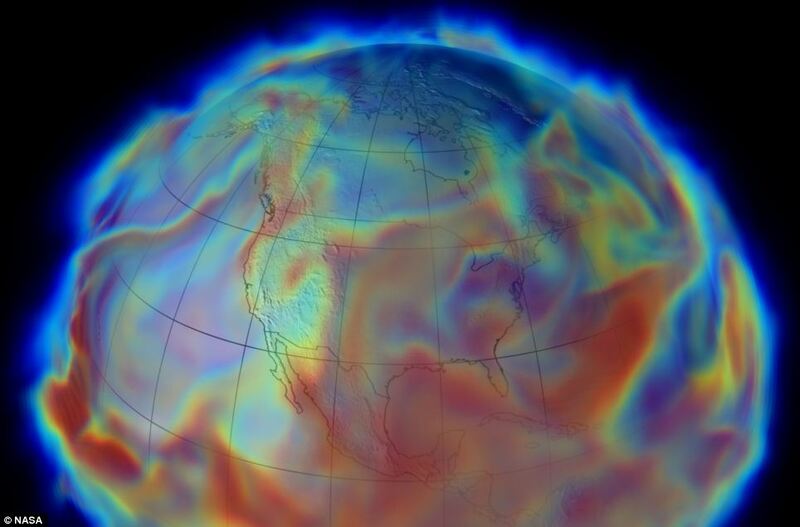 The high-resolution global atmospheric modeling was done using the Discover supercomputer at the NASA Center for Climate Simulation at Goddard Space Flight Center in Maryland. Nasa said the facility 'provides a unique tool to study the role of weather in Earth's climate system. Goddard Space Flight Center is the home of a state-of-the-art supercomputing facility called the NASA Center for Climate Simulation (NCCS) that is capable of running highly complex models to help scientists better understand Earth's climate. This short video introduces the NCCS and takes you behind-the-scenes into the fascinating field of climate modeling. Using supercomputers to process data from satellite observations, these models are used to predict weather and give a picture of how the Earth's systems and climate are changing. The Goddard Earth Observing System Model, Version 5 (GEOS-5) is capable of simulating worldwide weather at resolutions of 10 to 3.5 kilometers (km). 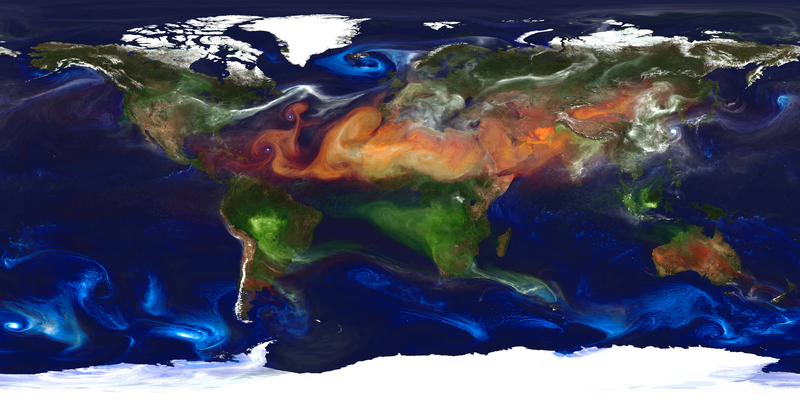 This portrait of global aerosols was produced by a GEOS-5 simulation at a 10-kilometer resolution. Planet Ocean takes us on an amazing journey over the entire planet via spectacular new aerial and underwater imagery. The film first dives into the secrets of the ocean – source of life, evolution of species, migration, predation – exploring exuberant coral reefs and mysteries of the abyss. Then everything changes: man appears and takes over the Planet Ocean. He invents fishing, conquers the seas, discovers oil and globalizes the world. The film's narration explores man's vulnerability and the effects of our lifestyle on the oceans that sustain us. The humanistic vision of Yann Arthus-Bertrand and Michael Pitiot invites us to preserve the world's oceans and commit ourselves to respecting life and its beauty. “Planet Ocean”is a 90-minute documentary filmed in HD,in association with Tara Expeditions. Tara Expeditions shared with the filmmakers our network of scientists and the information they accumulated during the expeditions. “Planet Ocean”received the 2012 Award for Best Cinematography at the Blue Ocean Film Festival in Monterey (USA).